We all know that subscription boxes are HUGE news right now. There are monthly beauty boxes, food boxes... even boxes for our pets! One subscription box I hadn't come across until recently, however, is Treatbox. Treatbox most definitely stands out to me, particularly in this increasingly over-saturated world of subscription boxes, because it's just so different. Instead of just supplying beauty products or healthy snacks, with no frills whatsoever, Treatbox is a monthly lifestyle box bursting with an array of different things. 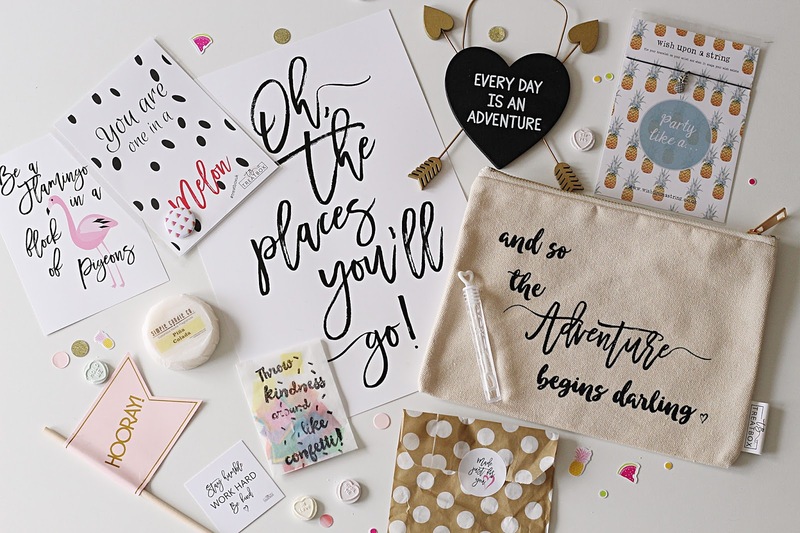 From adorable notebooks to pretty fairy lights, cute coasters to sparkly bath bombs, it has a little bit of everything I love, with a selection of cute quote prints thrown in for good measure. 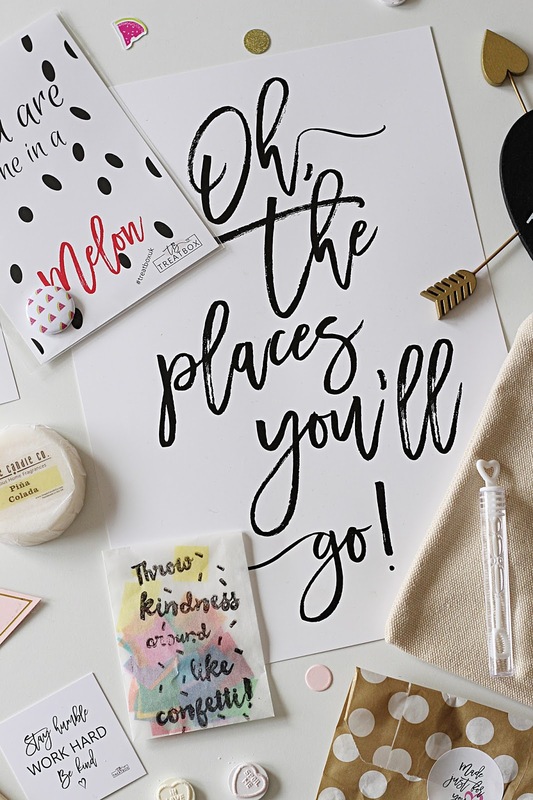 I feel like this subscription box is just perfect for the uber Instagrammable world we're currently living in... it's super pretty, packed with inspirational and motivational quotes, sweet treats and goodies you'll actually use. I've received both the July and August Treatboxes and have been completely and utterly in love with them both. The July Treatbox* (pictured to the bottom) was all about summer - and even opening it up I was hit with the uh-mazing smell of all things tropical. With a Pina Colada candle, an adorable makeup bag, pineapple bracelet, watermelon badge, 'Every day is an Adventure' plaque, several cute prints and other sweet add-ons like a packet of confetti, love heart sweets, bubbles and a 'hooray' flag, I squealed with delight upon opening it and have found the perfect home for everything featured. 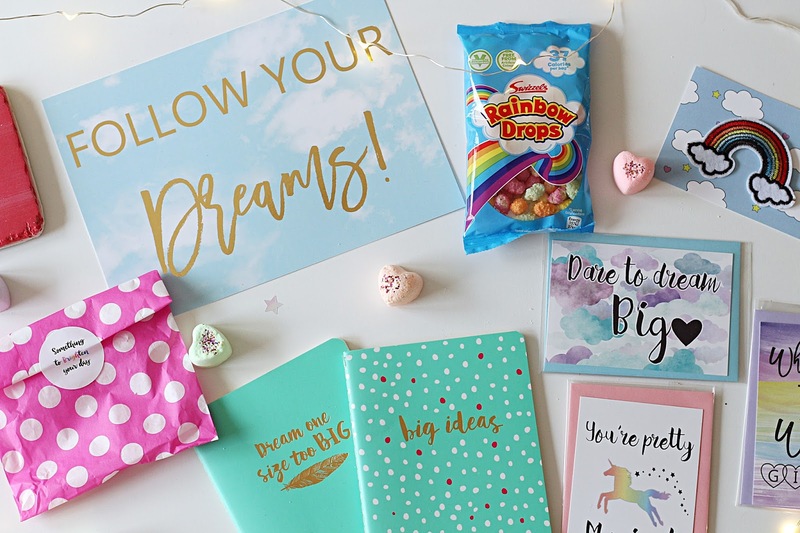 The August Treatbox* (pictured at the top) was all about dreaming big - and as a self-confessed dreamer, I felt a bit like this box was made for me. 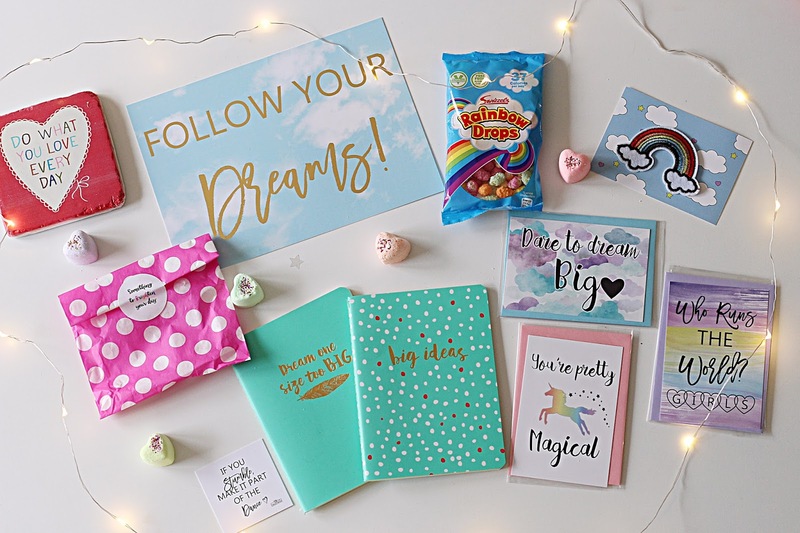 With a selection of cute cards, some lovely heart-shaped bath bombs, wire fairy lights, a rainbow patch, a set of two super sweet little notebooks, a 'Do what you love every day' coaster and of course, the obligatory sweeties and prints, I absolutely love every single thing in this box and I just feel like it's so me! Treatbox costs £12 as a subscription or £12.95 as a one-off, and I think it is totally and utterly worth it. I'm pretty sure the contents add up to more than that and the way each box is put together every month and comes through the postbox like a little surprise of loveliness makes it worth every penny. If you're not keen on surprises, you also have the option to put your own box together too - or you can buy the goodies featured in the boxes separately too. Overall I absolutely adore Treatbox and cannot recommend it enough. If you're looking for a new subscription box to sign up for, this is it! It's such a lovely monthly treat (pardon the pun!) that honestly always brings a smile to my face and brightens my day! I believe there are only a few September boxes left so get in quick if you want to get your treat on for next month!